“Know thy gadgets; first step in restoring some kind of wholeness to one’s life.” So observes John Jerome about his purpose for rebuilding a 1950 Dodge pickup. Yes, he needs the truck to haul manure, but Jerome also hopes that “by knowing every nut, lockwasher, and cotter pin I could have a machine that had some meaning to me.” Thus his year-long odyssey under the hood, among the brake shoes and valves, becomes more than a mechanic’s memoir; it is a meditation on machines, metaphysics, and the moral universe. 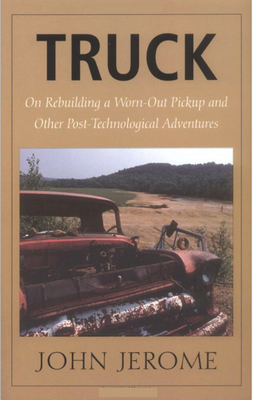 Long after its publication in 1977, the essential dilemma of Truck still rings true: as Jerome dismantles the aged straight six, he also disassembles our reliance on “two-hundred-dollar appliances that sport flaws in thirty-five-cent parts” and decries the “deliberate encapsulation, impenetrability, of the overtechnologized things with which we furnish our lives.” Despite gouged knuckles, a frigid New Hampshire winter, frustrating and inexplicable assemblies, and a close call when the truck rolls off its jacks, he perseveres. In the end, he admits, “I did not find God out there in the barn among the cans of nuts and bolts.” What he does find, however, is that he must make peace with technology; it’s a mistake, he says, to “assume there is a point on that line between the caveman’s club and the moon shot that marks the moral turnaround, before which technology was somehow benign, after which it is malign.” While Jerome gains a truck that runs—sometimes—we gain new insight into a technology that continues to encroach upon our lives. JOHN JEROME lived in western Massachusetts and was the author of many books, including The Sweet Spot in Time, Stone Work, and On Turning Sixty-Five. Before becoming a full-time writer, he worked at Car and Driver magazine and Skiing magazine. He died in 2002.